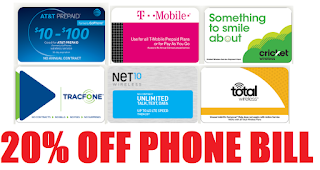 20% off Wireless Phone Prepaid Cards + Free Instant E-mail Delivery: T-Mobile, AT&T, Cricket Wireless, TracFone, Total Wireless, Simple Mobile or Net10. Just buy the gift card and use it to pay you next bill. Works For PREPAID bills only, won't work on regular monthly bills. You have to pay your phone bill anyways, why not save 20%!! CLICK HERE, choose your card.